Stepping in to skipper Glasgow Warriors on the opening weekend of their European Champions Cup campaign, scrum-half Henry Pyrgos masterminded a 37-10 thumping of Bath. We analyse his contribution to two pivotal tries. As Paul Ackford pointed out in his typically forthright column in Saturday’s Times, three of the five men to captain their country to a Rugby World Cup victory have been forwards. That much is hardly surprising – where better than the trenches to brave mud and bullets and set an example? More interesting is the fact that the remaining two figures to hold aloft the Webb Ellis trophy were scrum-halves – Antipodean pair David Kirk and Nick Farr-Jones won the World Cup in 1987 and 1991 respectively. Number nines often become the heartbeat of their team regardless of any official role. Still, this provides a striking illustration of how the position breeds leadership. Henry Pyrgos skippered Glasgow Warriors on Saturday in European Champions Cup the absence of talisman Josh Strauss, and embodied everything that went right in an exceptional 37-10 thumping of Bath. Sparky and accurate, he sent a compelling message to Vern Cotter ahead of the autumn. The former Loughborough University student was strangely deemed surplus to requirements for Scotland’s latest Six Nations campaign, but should certainly build on an impressive summer tour and see game-time against Argentina, New Zealand and Tonga this November. A more incisive running threat than Greig Laidlaw, he has developed his distribution and ability to mobilise the pack as well. 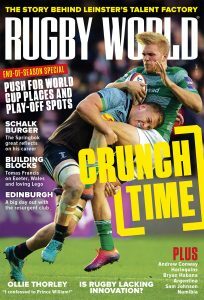 With South Africa and Samoa lurking in a beastly World Cup pool – as well Japan and USA, who can no longer be written off as merely plucky underdogs – Scotland could use Pyrgos to inject pace and off-the-cuff invention into phase-play. This weekend, his all-round effort was accomplished and assured – the performance of someone thriving in added responsibility. Indeed, Pyrgos’ contribution to Glasgow’s second and third tries encapsulated exactly what he can offer in terms of game-breaking verve. Bath’s starting side contained no fewer than seven full internationals, so the notion that such effectiveness might be replicated at Test level is hardly farfetched. Touching the ball twice in the movement, first executing an inch-perfect box kick and then delivering a long pass off his left hand, Pyrgos is instrumental in this smash-and-grab try. That said, we can learn a great deal from breaking down the processes. 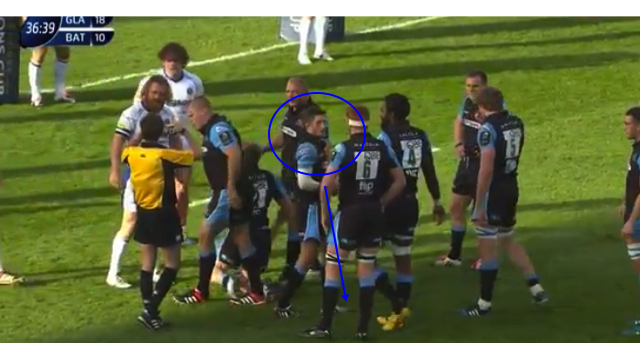 For example, watch how the scrum-half organises a blocker in Pat MacArthur (blue circle) to shield his right-footed kick. With this man in place, the possibility of a charge-down from defensive guard Dominic Day is nullified and Pyrgos can make contact without being put under pressure. The next step is the weight and height of the kick. The aim is to land the ball just outside of the 22 – stopping the chance of a defensive mark – and, crucially, to make possession contestable for his chasers. As the below screenshot demonstrates, Pyrgos achives this exactly. Tommy Seymour can storm forward to snare the catch ahead of Semesa Rokoduguni with Duncan Weir is following up to secure the ensuing ruck. 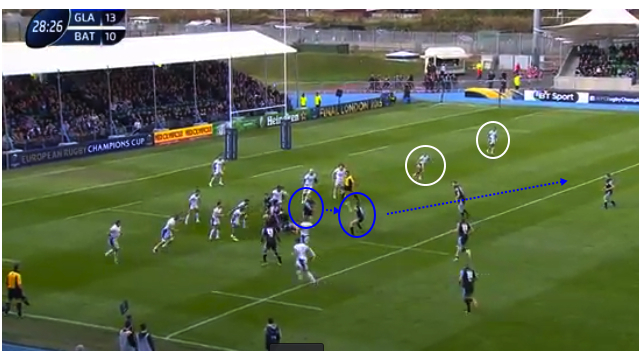 Though the ball drifts slightly behind first receiver Mark Bennett on its 20-metre trajectory, Bath’s two defenders Jonathan Joseph and Anthony Watson (circled in white) are isolated and facing a classic three-on-two. 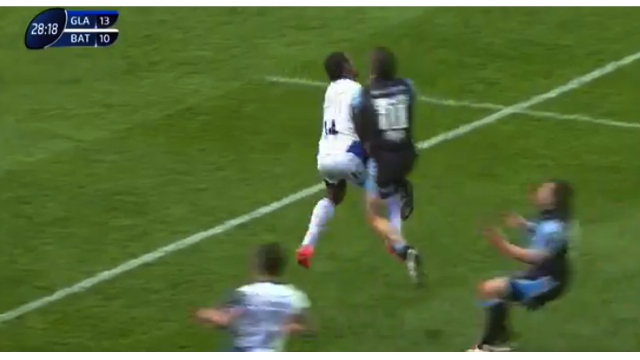 Latching onto Stuart Hogg’s fine offload, Maitland can squeeze over. Confidence and trust in his teammate’s communication are pivotal aspects here, both attributes of a man in form. Glasgow’s European campaign, which next encompasses a trip to Montpellier, and Scotland’s autumn will benefit from a Pyrgos in this sort of mood. Thanks to BT Sport for the footage. You can purchase tickets to the European Champions Cup final here.